I am a thrill seeker at heart. I am willing to try some of the most adrenaline pumping things one could try when traveling. 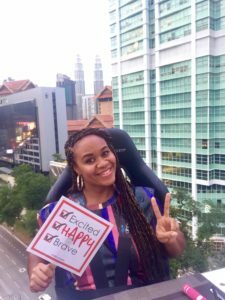 Check out my top 5 must-try excursions from my travels thus far. 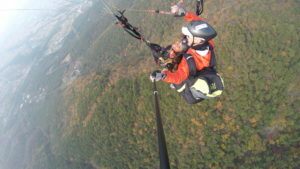 While living in South Korea, I saw that there was an opportunity to paraglide close to where I lived. Paragliding consists of running off of a cliff or mountain into the air. As the instructor told me “run until the ground leaves you.” You are attached to an instructor and you all are carried by a large parachute while sitting on tiny boxes. The experience lasted close to 7 minutes and the guide even did a few spirals as we came closer to the ground. I had fun and would absolutely do it again. Now, I have been snorkeling in almost every place that allowed it in my travels. However, my most thrill seeking snorkeling moment came in the Maldives. 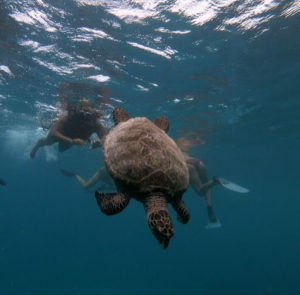 In addition to being up close and personal with some of the world’s most exotic fish, I was able to swim alongside a large sea turtle. It was a bit scary when the turtle would literally brush you as he (or she) came to the top for a little air. They didn’t bother you though and quickly went back down to continue about their business. What is an underwater sea bike? It’s exactly what it sounds like. 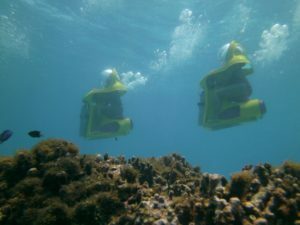 They are motorized scooters/bikes that you can ride along the ocean floor. The front of the bikes hold a tank that helps regulate the air pressure in your dome-like helmet. Otherwise, you will drown. (sorry just stating the obvious) I was able to do this in Cancun, Mexico. This was on my bucket list only a short time because once I got the idea to do it, well I did it! That’s just how I roll. 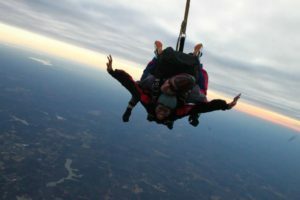 I didn’t travel far to skydive, it was just across the border in South Carolina. I would love to jump again one day, hopefully in Dubai next time. The nerves only hit you (well me) as the tandem guide moves you close to the door and your feel that gust of wind hit you. This is when you realize, there is no turning back from this point. However, once you begin to freefall adrenaline takes over. When I initially heard that you could eat dinner suspended from a crane in the air, I was all in. This once-in-a-lifetime experience is offered in cities all over the world. I had the chance to do it in Kuala Lumpur, Malaysia. You are strapped in a seat that can rotate as well as recline, while your feet dangle. You are seated at a square-shaped table with the other guests at your dining experience. You are served a 3-course meal while being entertained by the crew and taking in views from above. You literally are sitting on top of the world! Cruising Solo: Is It Worth It?